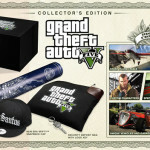 Rockstar just announced the special and collectors editions for Grand Theft Auto 5. We have got some images of them for you to feat your eyes on below the press release. We are proud to announce full details of the Special Edition and Collector’s Edition of Grand Theft Auto V– which will be available for worldwide pre-order starting today from participating retailers. 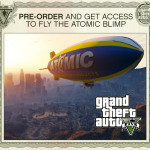 As an additional bonus, those who pre-order any edition of Grand Theft Auto V (including the Special Edition, Collector’s Edition or the standard retail edition) between now and September 17th will get access to pilot the Atomic Blimp in-game vehicle. High above the streets of Los Santos floats the Atomic Blimp, hawking Los Santos’ finest tire company (whose products are available in any LS Customs garage). Pre-order now to gain the ability to pilot the most iconic and leisurely aircraft in the Los Santos skies. The Grand Theft Auto V Special Edition. Click here for more detail. The Grand Theft Auto V Collector’s Edition. Click here for more detail. 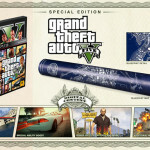 The Grand Theft Auto V Collector’s Edition comes packaged in a premium outer box featuring a foil embossed Grand Theft Auto V logo on the top, finished with a matte, scuff-resistant film lamination, housing all of the contents. The Grand Theft Auto V Collector’s Edition and Grand Theft Auto V Special Edition are the perfect way for fans to celebrate the return of GTA, with special digital content and exclusive Grand Theft Auto Vphysical items. Grand Theft Auto V Collector’s Edition will retail for $149.99, while the Grand Theft Auto V Special Edition will retail for $79.99. All versions are now available for pre-order until September 17, 2013 while supplies last.